Stephen Colbert has a bone to pick with Oxford Dictionaries. 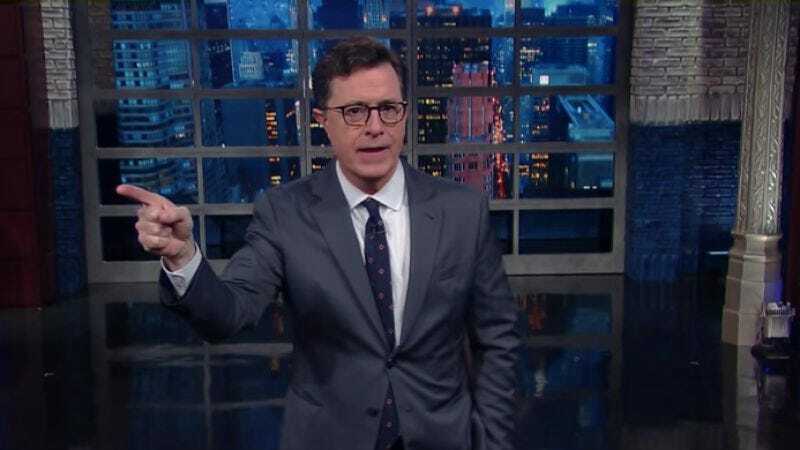 It designated “post-truth” as the word of the year for 2016, which sounds an awful lot like his term “truthiness,” coined in the days of The Colbert Report. “I am pre-enraged,” Colbert said on The Late Show last night. Both terms have to do with disregarding facts in favor of what just feels right, and, indeed, Oxford did acknowledge the terms’ relationship to one another. But Colbert is still mad. “Post-truth is clearly just a rip off of my 2006 word of the year, Truthiness,” he declared, referring to Merriam-Webster’s anointment of the term. We would have appreciated a ”Colbert” The Character bit about this, but that might piss off the fine folks at Comedy Central. If nothing else, it’s proof that ”Colbert” was prescient, and that Bush-era inanity is back.